This recipe uses butter instead of coconut oil. Makes a nice, thick coating that freezes hard. This one did NOT work. Was too thick and would not stick to the zoku sticks. Had to eat it out of the pop maker with a spoon (couldn't let it go to waste)! 100% juice juiceboxes make great, easy pops. Use two different flavours to make stripes. Easiest pops ever and tastes just like a fudgsicle! Even better if dipped in homemade magic shell sauce. This takes a bit of prep but is amazing in the Zoku. The lemon and buttermilk combo is delicious. Can add thin slices of lemon to the side. Recipe makes enough for about 12 pops total. This recipe makes a thin chocolate pudding that works great in the Zoku. Be careful pouring it in as it will fill one side before the other. Makes enough for 12 pops (done over 2 nights). The pudding is very sweet but once frozen tastes just right. 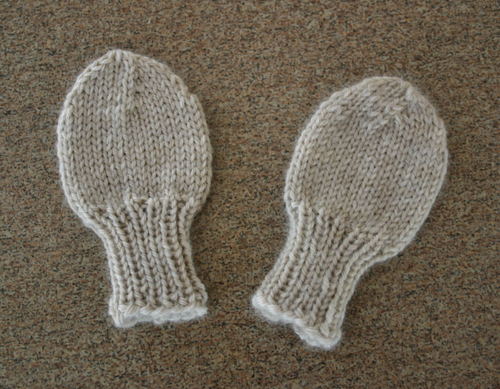 I wanted something to go with the Fiber Trends Ear Cozies hat that I knit this week, so I invented a little tiny pair of newborn mittens to match. Most newborns I know don't go out in the cold without being bundled in a car seat and car seat cozy, so these are more for anti-scratch purposes than winter warmth, but I made them out of wool so they could be used for either! Using the smaller (3.5mm) needles, cast on 24 stitches. Join into the round and knit in 1x1 rib for 15 rounds (or 2"). Knit straight (knit every round) for 14 rows. Cut yarn, draw tail through remaining stitches and pull tightly. Nothing yet that I know about, but I haven't heard from her in three days now (and we usually email every day), and I'm getting worried! !